This Middle Atlantic Slim 5 Series 19" Equipment Rack 5-14-26 with black, powder-coat finish ships knocked down via UPS to lower delivery costs, but comes complete with all hardware for quick assembly. A bolt-together design and mechanically interlocking corners guarantee exceptional strength and years of use. Its solid frame construction and heavy-duty steel top and bottom support 400 lb. of equipment with capacity of up to 14U. Front and rear, fixed-position, 11-gauge threaded, 10-32 rack rails come standard with this model. Also included are 1/2" and 3/4" EKOs (electrical knock outs) on the top and bottom rear for efficient cable management. 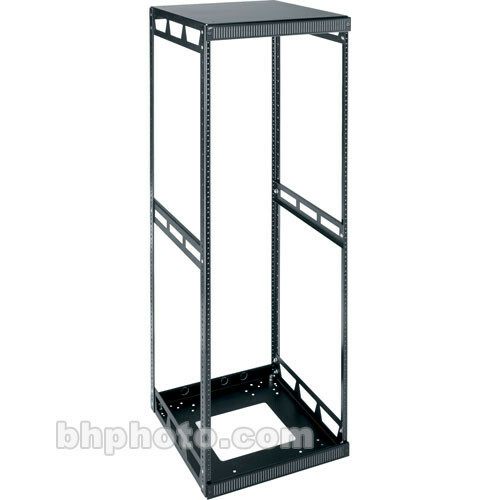 Ample opening on the bottom of the rack offers additional flexibility with cables and venting. Gang this rack together with or without optional cable chase for unlimited growth potential in your set up. Pre-punched holes allow you to add optional casters or leveling feet. This model has been UL Listed (Underwriter Laboratories, Inc.) in the United States and Canada. All-steel construction, bolt-together design, and mechanically locking corners guarantee exceptional strength and years of use. Tested and certified by United Laboratories, Inc. (UL) in the United States and Canada. New knockout plates on all A/V racks now accept wireless antennas. EKOs on top and bottom rear facilitate cable management. Dimensions (WxHxD) 19 x 28-1/4 x 26"
Box Dimensions (LxWxH) 30.0 x 22.8 x 7.0"